Continuity is a free puzzle game that pretends to be a platformer. Like most side-scrolling platform games, you control a character that runs across the screen, jumps to climb and avoid obstacles, and must make its way to the end of the level. Unlike any other platformer I know, you must shuffle the level itself to get to the end. In Continuity, you constantly switch between shuffling level segments and traversing the levels. Zoomed-in, Continuity looks like a bare-bones platformer. There are no enemies roving around the level, and no other moving objects for that matter. But hit the spacebar, and suddenly the screen zooms out, and you discover every level is made up of tiles. The arrow keys, previously used for running and jumping, now shuffle the pieces of the level around. It is up to you to create a path your character can traverse, collect the key, and make it to the door at the end of the level. To make it across the gap between two Continuity tiles, the seam between them must precisely match. You can't jump to reach a higher platform on the neighboring tile--you must carefully shuffle them in zoomed-out mode until they match, and then make your move. Gameplay constantly shifts between zoomed-in and zoomed-out modes. Often, you zoom out to shuffle, zoom in to move, and immediately zoom back out to shuffle again. 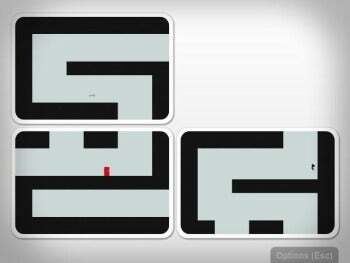 Continuity's carly levels are segmented into two or three tiles, but once you pass the first few levels, you will have to deal with five tiles or more. Continuity's soundtrack has a split personality, just like the game: When zoomed out, the game plays a relaxing, ambient piano loop. Zoom in, and the relaxing music quickly fades, to be replaced by frantic electronica. I understand the artistic choice here, but it does create an irritating dissonance. The graphics are basic, but that doesn't make Continuity any less playable. And if you fall in love with this original game, its next generation, Continuity 2, is available for iOS. Shuffle blocks containing parts of the level, and then navigate them to win this puzzle-platformer.